Nowadays, web applications are common around the world. Nearly every major company or organization has a web presence. Maximum of these companies and organizations use web applications to provide various services to users. Some of these web applications employ database driven content. The back-end database often contains confidential and sensitive information such security numbers, credit card number, financial data, medical data. Typically the web user supplies information, such as a username and password and web applications receive user request and interact with the back-end database and returned relevant data to the user. 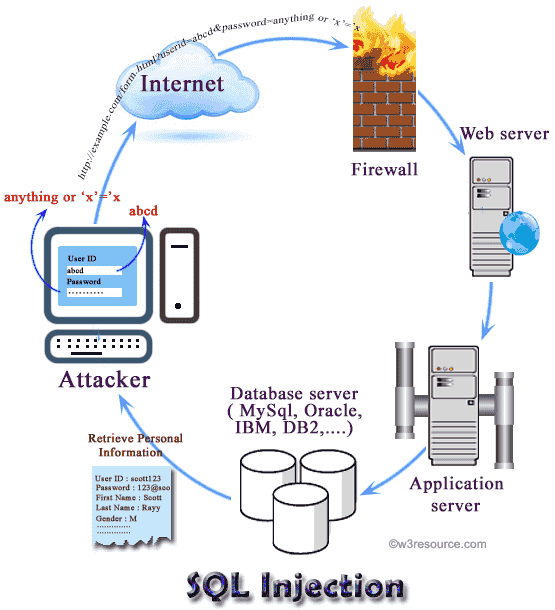 SQL injection is a technique (like other web attack mechanisms) to attack data driven applications. This attack can bypass a firewall and can affect a fully patched system. The attacker takes the advantage of poorly filtered or not correctly escaped characters embedded in SQL statements into parsing variable data from user input. The attacker injects arbitrary data, most often a database query, into a string that’s eventually executed by the database through a web application (e.g. a login form). Through SQL Injection attacker can obtain unauthorized access to a database and can create, read, update, alter, or delete data stored in the back-end database. Currently, almost all SQL databases such as Oracle, MySQL, PostgreSQL, MSSQL Server, MS Access are potentially vulnerable to SQL injection attacks. In its most common form, a SQL injection attack gives access to sensitive information such as social security numbers, credit card number or other financial data. - Identify the database type and version. - Insert, modify or delete data. - Denial of service to authorized users by locking or deleting tables. - Execute remote commands by calling stored functions within the DBMS which are reserved for administrators. - Injected through user input. - Injection through cookie fields contains attack strings. 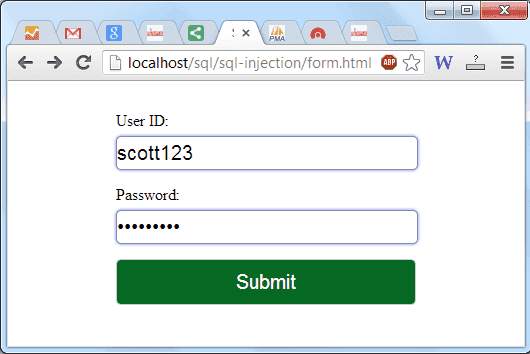 - Injection through Server Variables. - Second-Order Injection where hidden statements to be executed at another time by another function. In computer security, a vulnerability is a weakness which allows an attacker to reduce a system's information assurance. Web-based forms allow some access to the back-end database to allow entry of data and a response, this kind of attack bypasses firewalls and endpoint defenses. 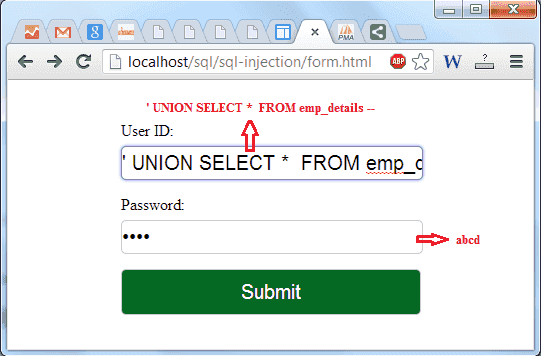 Any web form, even a simple logon form or search box (where a user can input data), might provide access to back-end database by means of SQL injection. 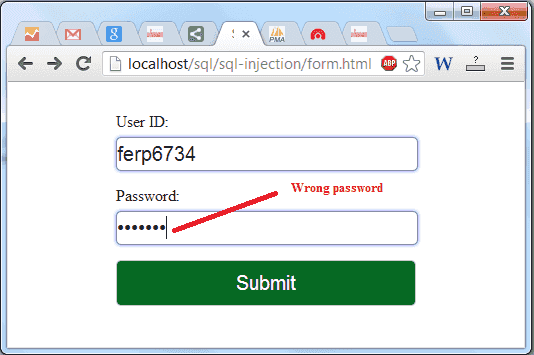 The common reason that an application is vulnerable to SQL injection is improper filtering and lack of validation for user input. Input forms are quite common to collect data from a user. So, practically it is not feasible to close all the entry points to bar SQL injection. To prevent attacks developers must apply proper filtration/validation on all forms. Web servers are computers that deliver Web pages. Every Web server has an IP address and possibly a domain name. For example, if you enter the URL https://www.w3resource.com/index.php in your browser, this sends a request to the Web server whose domain name is w3resource.com. The server then fetches the page named index.php and sends it to your browser. The Web server stores all of the files necessary to display Web pages on the computer. While passing data to server side form a web page, often GET method is used to append user supplied data at the end of the URL (e.g. example.com?q=userid&p=password). For an attacker, this opens an opportunity to obtain the values passed in this fashion and do some malicious stuff. Here is a simple login form (form.html) which can authenticate a user id and password. When this form is submitted, the username and password are passed to action.php script. A user will be authenticated by providing correct user id and password. The log in process is done by building a SQL query and comparing the user id and password to the login records in the database.
" -- Personal Information -- ". $row." Last Name : ". Invalid user id or password";? If the userid and password match a record in the database, the personal information of the user will be displayed. Otherwise, "Invalid user id or password" will be displayed. When a genuine user submits his details (user id and password), an SQL query is generated from these details and submitted to the database for verification. If both user id and password combination are valid, the user is allowed access. On verification, a genuine user is granted appropriate access and display his or her details otherwise it generated an error message. Based on operator precedence, the WHERE clause is true for every row, therefore the query will return all records. In this way, an attacker will be able to view all the personal information of the users. See the following login form and the output. 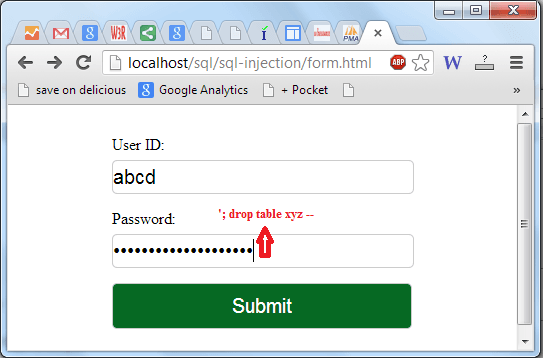 The example is already explained in "Example of a SQL injection attack". After completing the ﬁrst query ( returned an empty result set (i.e. zero rows)), the database would recognize the query delimiter(";") and execute the injected second query. The result of executing the second query would be to drop table xyz, which would destroy valuable information. This type of attack can be done by inserting a UNION query into a vulnerable parameter which returns a dataset that is the union of the result of the original first query and the results of the injected query. The SQL UNION operator combines the results of two or more queries and makes a result set which includes fetched rows from the participating queries in the UNION. 1) A number of columns and order of columns of all queries must be same. 2) The data types of the columns on involving table in each query should be same or compatible. 3) Usually returned column names are taken from the first query. By default the UNION behaves like UNION [DISTINCT] , i.e. eliminated the duplicate rows; however, using ALL keyword with UNION returns all rows, including duplicates. The two dashes (--) comments out the rest of the query i.e. ' and password = 'abcd'. Therefore, the query becomes the union of two SELECT queries. The first SELECT query returns a null set because there is no matching record in the table user_details. The second query returns all the data from the table emp_details. Let try it with our login form. The headings (e.g. User ID :, First Name : ect) were previously declared in action.php, but the output shows that the result contains employee_id, first_name, last_name, email, phone_number, hire_date, job_id, salary, commision_pct from the table emp_details. In this type of injection an attacker is trying gather information about the type and structure of the back-end database of a Web application. The attack is considered as a preliminary step for further attacks. If an incorrect query is sent to a database, some application servers return the default error message and the attacker takes the advantage of this weakness. They inject code in vulnerable or injectable parameters which creates syntax, type conversion, or logical error. Through type error, one can identify the data types of certain columns. Logical error often exposes the names of tables and columns. Here an attacker checks whether the system is using a MySQL version is 5.x or not, making the server delay the answer in 15 seconds (the attacker can increase the delay's time). A stored procedure is a subroutine available to applications that access a relational database system. A stored procedure is actually stored in the database data dictionary. Typical use for stored procedures includes data validation or access control mechanisms. Furthermore, stored procedures can consolidate and centralize logic that was originally implemented in applications. Extensive or complex processing that requires execution of several SQL statements is moved into stored procedures, and all applications call the procedures. One can use nested stored procedures by executing one stored procedure from within another. Stored procedures type of SQL injection tries to execute stored procedures present in the database. Most of the database have a standard set of procedures (apart from user defined procedures) that extend the functionality of the database and allow for interaction with the operating system. The attacker initially tries to find the database type with another injection method like illegal/logically incorrect queries. Once an attacker determines which databases is used in backend then he try to execute various procedures through injected code. As the stored procedure are written by developers, therefore these procedures do not make the database vulnerable to SQL injection attacks. Stored procedures can be vulnerable to execute remote commands, privilege escalation, buffer overflows, and even provide administrative access to the operating system. The above command causes a database to shut down. In the above code the char() function and ASCII hexadecimal encoding have used. The char() function returns the actual character(s) of hexadecimal encoding of character(s). 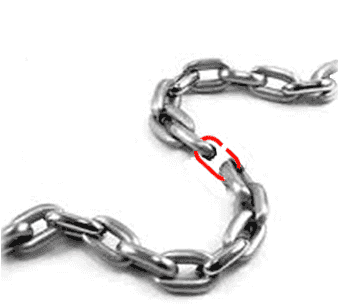 This encoded string is translated into the shutdown command by the database when it is executed. – Simple input check can prevent many attacks. – Always validate user input by checking type, size, length, format, and range. – Test the content of string variables and accept only expected values. – Reject entries that contain binary data, escape sequences etc. This can help prevent script injection and can protect against some buffer overrun exploits. – When you are working with XML documents, validate all data against its schema as it is entered. – Certain characters and character sequences such as ; , --, select, insert and xp_ can be used to perform an SQL injection attack. – Remove these characters and character sequences from user input which reduces the chance of an injection attack. – Scan query string for undesirable word like "insert", "update", "delete", "drop" etc. check whether it represent a statement or valid user input. – Write a function which can handle all of this. /* ... */ Comment delimiters. The text between /* and */ is not evaluated by the server. – There are so many ways to attack a database, therefore the developer should check and authenticate all input sources and disallow unidentified or untrusted users/websites. – Create "low privileged" accounts for use by applications. – Never grant instance­level privileges to database accounts. – Never grant database­owner or schema­owner privileges to database accounts. – Be aware of the permission scheme of your database. – Some application server's default error reporting often gives away information that is valuable for attackers (table name, field name, etc.). – The developer should configure the system correctly, therefore this information will never expose to an unauthorized user. 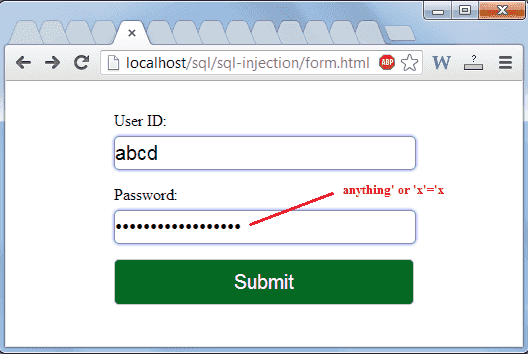 Apart from the above, there are several methods which can prevent from SQL injection.